Changes are coming to TTC routes in February with the most significant being on the streetcar network. I provided an overview of the streetcar changes in a previous article, but the details of headways and running times are in the spreadsheet linked below. On the bus network, there are several tweaks to running times and headways. Extra running time for Metrolinx construction projects will be provided on 36 Finch West, 63 Ossington and 71 Runnymede. Evening service on the 12 Kingston Road bus will be modified so that trips after 10:30 pm on weekdays and 5:30 pm on weekends run via the 12B routing along Kingston Road instead of dodging north to serve Variety Village. Service on 121 Fort York-Esplanade will lose one bus during weekdays all day except the AM peak, and weekend evenings. This route has chronically erratic service that affects demand, but that is not addressed in the change. On 1 Yonge-University, all crew change will now occur at Wilson Station rather than being split between Wilson and Eglinton Stations due to pending construction at the latter. My thoughts on the TTC’s 2018 Ridership Growth Strategy are on the Torontoist website. An important issue for the King Street Transit Priority pilot is the rising demand on that corridor. Previous TTC stats showed a total of 65,000 riders using the 504 King and 514 Cherry lines combined, but this has now been updated to 71,000 even before the pilot began. Further growth comes from riders attracted to the improved service, and the line is now crowded beyond capacity at some times and locations. The TTC has announced “improvements” from time to time on the King route, but this masks declines in service capacity. The service design for the am peak period uses a base service about every 4 minutes overlaid by peak “trippers” that bring the headway down to about 2 minutes. However, the number of trippers has fallen over the years and in practice, the “wave” of very frequent service now lasts only about half an hour. This comes eastbound on King at Dufferin 6:50 and 7:20 am, westbound at Broadview between 7:45 and 8:15 am, and eastbound again between 8:55 and 9:25 am. There are now seven trippers where once there were sixteen, and for some time streetcars on the trippers were replaced by buses at a lower capacity. Recently, peak vehicles were swapped between 504 King and 505 Dundas so that the trippers could revert to streetcar operation. When buses began operating on 504 King, the TTC claimed that this was a service improvement. This was true for a time when buses allowed the service to build back to its previous high point, but over time the number of bus trippers fell. Using the TTC’s vehicle tracking data, one can plot the actual capacity operated at various points and times on King Street. These are actual, not scheduled, capacities, and they reflect the day-to-day fluctuations in service and vehicle types. For the purpose of the charts here, the Service Standards planning capacities are used. These are not the crush capacity of vehicles, but a target level in Board-approved TTC standards for an average level of crowding that should not overwhelm the service with loading delays and severely uncomfortable conditions. Whether the TTC actually achieves this is another matter, but the numbers give an indication of the relative levels of service operated over time. Here is an example of one chart showing capacity eastbound at Bathurst & King between 7:00 and 8:00 am from January 2016 to December 2017 (note that February 2016 data are missing). The capacity provided here was at its height in the spring and summer of 2017 when ALRVs normally used on 501 Queen were redeployed to 504 King. In fall 2017, service levels were reduced because of the change in vehicle type. Noteworthy in this chart is the growth in capacity provided by Flexitys first on 514 Cherry (building up to full low-floor operation by mid 2017) and more recently with the addition of the new cars to 504 King. Although they do not make up half of the vehicles operating on King, they account for half of the capacity in the central section. 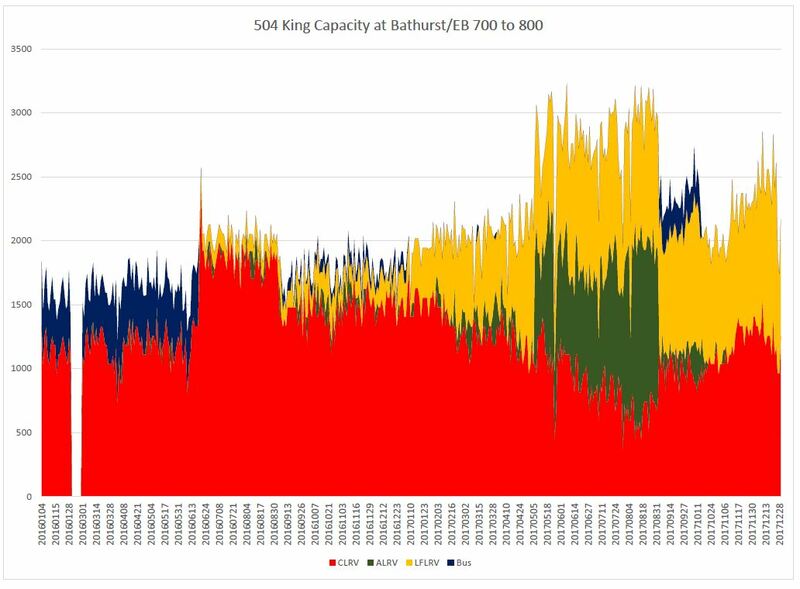 For a longer-range view of capacity, here is the same chart with data (where I have the details) going back to December 2006. 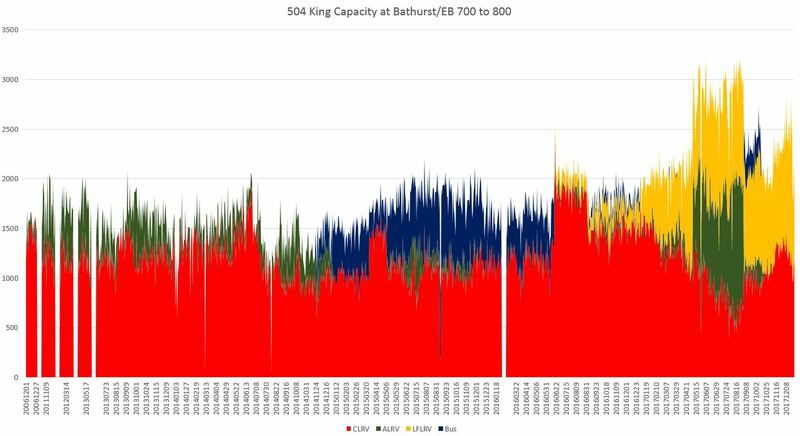 This illustrates the long period during which the capacity provided on 504 King was static even as land along the route redeveloped. This is a chronic problem on the streetcar routes because an order for new cars and a larger fleet was delayed so long. The sets of charts below illustrate capacities at five locations and times. Each set contains four charts covering the peak periods from 6-10 am and 3-7 pm depending on which period is illustrated. Service eastbound at Jameson does not include the 514 Cherry cars which enter the route at Dufferin. Flexitys appear here only after their recent addition to 504 King. Note how the capacity provided here drops in the hour from 8-9 am compared to those on either side of it. Service eastbound at Bathurst includes the 514 Cherry cars and the growing contribution of Flexitys on this route is evident from June 2016 onward. The PM peak service design is different from the AM in that there are few or no trippers (depending on which schedule one considers), and so this location has been less affected by cutbacks in that part of the service. However, service capacity has not changed much over the past two years especially during the peak 5-6 pm hour. The situation at Bathurst is similar to that at Yonge, although it can be affected by cars short-turning at Spadina. After the 503 service is added in February, the capacity at Yonge will be slightly higher than at Bathurst. The capacity of service outbound west of Dufferin is, if anything, lower now than it was in past years. This reflects the concentration of service east of Dufferin with the coming of the 514 Cherry route. In summary, riders who believe that service, as measured by capacity, has been better in the past are in many cases correct. An important part of the King Street Pilot will be to determine how much latent demand can be attracted to the route through the combination of lower travel and wait times, and greater route capacity. Updated January 19, 2017 1t 12:45 am: The TTC advises that the numbers that were included in the speaking notes of the Powerpoint presentation regarding Presto usage were incorrect. The info I used showed the change for both 504 King and 501 Queen to be about equal, begging the question of how this could show a King-specific ridership growth. Correct data now appear in the article. TTC Staff presented updated information on the King Street Pilot to the Board at its January 18, 2018 meeting. 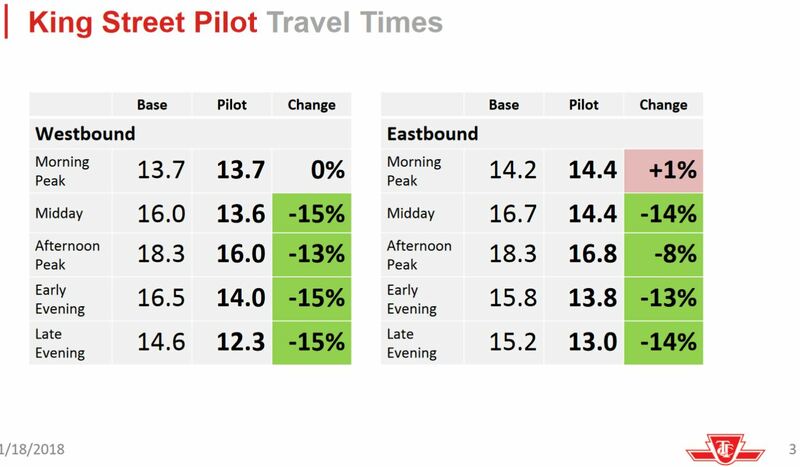 The changes in travel times are shown for all periods during the day, not just for the peak periods as shown in the City’s December 2017 dashboard. 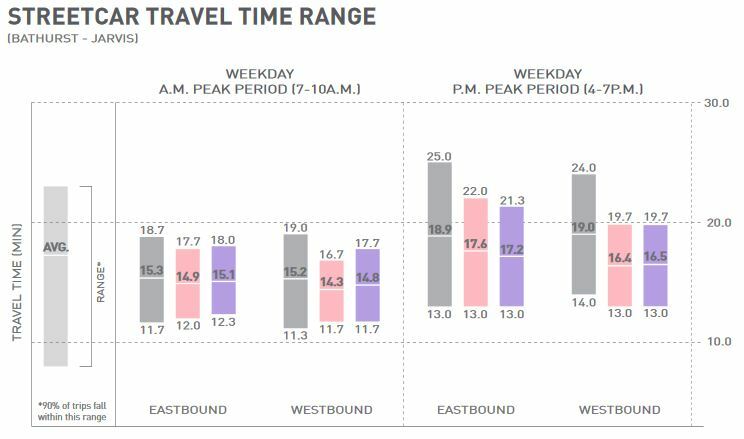 These numbers are different from those reported by the City because the TTC uses a different definition of the peak period (6-9 am, 3-6 pm) while the City’s figures cover begin and end one hour later in both cases. In either case, averaging over a three hour period reduces the benefit during the peak hour. The TTC emphasizes that the benefits involve not just the pilot area, but the entire route through improved service reliability and reduced wait times. Original reports of rididership growth cited only the peak eastbound hour at Spadina where demand rose from 2,100 to 2,600. Additional information about ridership growth based on Presto card usage shows that the improvement is more widespread. The table below compares the rise in Presto card usage on King and Queen streets from November 1 to January 8 with other routes. Both show higher figures than the balance of the system. 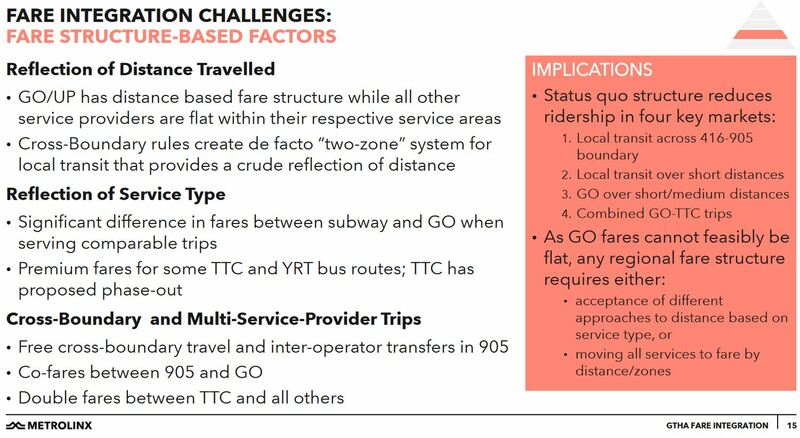 Correction: The following section includes figures that were taken from a TTC-supplied Powerpoint that had incorrect information in the speaking notes. Corrected info appears below.. It is unclear whether this simply represents a faster uptake of Presto by downtown riders than an increase specific to King Street. Indeed if Queen were showing similar riding growth, one would expect calls for much more service on that route too. The corrected data shows that the change in Presto usage on Queen lies in the same range as on other routes while on King it has gone up substantially. This is not just an AM peak value, but an all-day one indicating a general rise in demand on King throughout its operating periods. Although an all-day ridership on the King corridor was previously cited as 65,000, a recent count was 10% higher at 71,000. In mid-February, service on 514 Cherry will be improved during the off-peak. 503 Kingston Road will revert to streetcar operation between Kingston Road & Victoria Park and King & Spadina during weekday peak and midday periods. This will replace the 502 Downtowner bus which will now operate only during peak hours to Queen & University to shift some capacity to King Street. Schedules will be adjusted to meet peak demand periods. Additional unspecified changes will occur in May based on updated ridership information. Full operation of 504 King with low floor cars is planned for the end of 2018 with most of the route converted by the fall.